This is about wheel drive belts, chains and sprockets on dual belt or belt & chain models. The bigger the shaft sprocket, the more the torque or low end pulling power, while smaller provides more top speed. 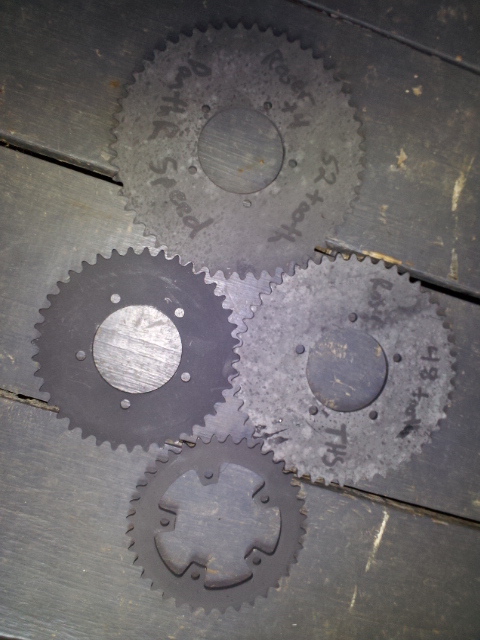 we offer 12 & 13 toothed hardened shaft sprockets. Wheel sprocket is the same principal. small=speed & large=torque/pull. Cobra & The Rock & Nuke are 20 tooth shaft/belt gear to 60 toothed wheel belt gear=ratio 1:3 which provides good speed on 9 inch tire. most other models are: 1:3.16 or 1:3.95 gear ratio which provides good torque. big wheel models are 1:5.1 select your factory or custom gear ratio by selecting 1 of 2 available #35 Chain Drive shaft/hub mount sprockets and many different wheel plate style sprockets. shaft sprockets have set screw, but must be welded to shaft after determining correct position & tracking. wheel sprockets are bolt on. call scooterman @ 256.468.2761 u.s.a. english for assistance in ordering custom chain drive.